The last chapter dealt with Hitler. In this chapter Schlabach first introduces the concept of nonviolent policing, which some people may regard as a joke. How are police effective if they don’t use force? But the same question could be asked of soldiering, perhaps. But what Schlabach really gets into here is that there is not a full pacifists consensus (since, as we recall, there is not just one “pacifism”). So he gets into the details about the kinds of responses to the question, different ways Christians can and have cooperated with, and even been, police. If the situation isn’t just, it may be difficult to carry out just policing in the first place. Schlabach reminds us of the issues of justice in the police force, such as profiling and escalation. It ain’t Mayberry everywhere. While messages like “kill the police” are never justified, they speak from an experience in which the police are not always (and in some places are never) the “good guys”. The Quakers made peace treaties with the American Indians and stuck to them, they were able to conduct policing more peacefully than most of the other colonies. So instead of saying “no” to police, Schlabach says we need to “perfect it through humane, communal, nonviolent means.” He draws a lot of examples from the Amish and Mennonites, since they nearly always set a better example of peace than most bodies in American Christendom. Churches must witness to the world the possibility of nonviolent policing. We are the kingdom at hand (Luke 4), the tangible kingdom, yet Schlabach admits the tension between the kingdom being established already, yet not realized as the “eschaton” the kingdom of Jesus’ return in the end. There is also tension in how we view the kingdom, in how it interacts with the kingdom(s) of the world. The world rules by force, while the kingdom of God rules by service (Matt. 20). Out of these two tensions come several approaches to civil government from peace churches. Schlabach points to Jeremiah’s message to his people, warning them both that they were foreigners in exile in Babylon, yet admonishing them to seek “shalom” with their host city. We must “respond flexibly to our neighbors yet faithfully to God.” Christ’s kingdom is foreign even to America, yet we must seek shalom with her and demonstrate it for her as best we can. And yet often we struggle to find creative responses to violence, as violence is not creative, but only destructive. At this point, I find myself standing in what Schlabach calls “honestly unfinished pacifism,” in which we pursue pacifism but recognized that our commitment is unresolved. “Such honesty,” he says, “actually helps prevent a slide into more and more fearful and security-obsessed responses to crime.” This is the first step that I believe most Christians in America today need to make, and I believe this level of commitment is unquestionably what Jesus calls us to. I may not have all the answers to all the questions of what to do in a violent situation, but I do know that the attitude I see around too many of my fellow Christians is the wrong attitude. That alone puts many of us in the wrong, and when we recognize we are wrong we must repent and turn back. Under such a commitment, Slabach says, “only the absolute minimum of violence is therefore in any way excusable.” Do we really believe that? How often to you think of a violent or forceful solution to a problem you see in the world? Think on what Jesus would say to that. Use his words and deeds, not your picture of him. For those of us who are honestly unresolved, yet committed seriously to the peacable kingdom that Jesus told us was at hand (meaning it’s already here), Slabach urges us to “give people time to grow into pacifist commitment and practice.” Let us at least move towards peace, in a real way, not merely smiling at people and hoping that more enforcement will deter violence. Take more seriously your commitment, because it means getting more involved, not less. Peace is never easy. How does this scene from the movie Witness make you feel? Do you clap for Harrison Ford? Or are you disappointed in his character’s decision as I am? Do you tell yourself “that guy had it coming”? Whether he did isn’t the point. After all, if we are Christians, we must ask what would Jesus do? Now if you can observe this scene from the climax of the same film. I warn you that there is foul language, and I am not endorsing foul language, but asking you that if your conscience permits to endure hearing it for the events that unfold. If you must, mute the clip until it passes the first 30 seconds. How do you feel about this instance, in comparison with the previous one? Notice how the Amish throw down their pitchforks, their only potential weapons. Notice the barricade they form as a community. Given, this is a fiction. But be well aware that among many Amish communities and others events with similar outcomes have unfolded. 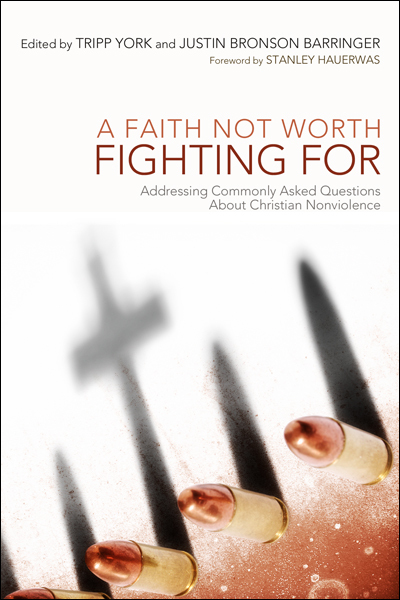 To what extend to you believe in deterring crime through nonviolence? What successful examples have you seen where violent policing force could have been used but something else was? What suggestions do your have from your experience? This entry was posted in Books, Faith, Peace and tagged Christians, cops, escalation, fear, force, gang violence, honestly unfinished pacifism, Jesus, law, nonviolence, pacifism, peace, police, police brutality, profiling, protection, Quakers, security, shalom. Bookmark the permalink.